A regional body comprised of several southern African nations is refusing to recognize Madagascar opposition leader Andry Rajoelina as the island nation’s new president, an official said. The Southern African Development Community group, which met Thursday in Swaziland, has “completely rejected the legitimacy” of Rajoelina, the organization’s executive secretary, Tomaz Salomao, told CNN. Madagascar’s military handed over the country’s reins to Rajoelina on Wednesday, ending a two-month political crisis. The former disc jockey-turned-mayor of the nation’s capital city declared himself president of a transitional government, and was confirmed by Madagascar’s high court. He is expected to be inaugurated on Saturday. Former President Marc Ravalomanana ceded power to the military on Tuesday after insisting over the weekend he would remain in control. Analysts have said he likely had little choice but to step down once he had lost much of the army’s support. U.S. State Department spokesman Robert Wood told reporters: “We believe recent political developments in Madagascar constitute an undemocratic transfer of power. And we’re currently evaluating what impact this transfer is going to have on all elements of our relationship with the government of Madagascar.” A constitutional crisis, however, may be looming. 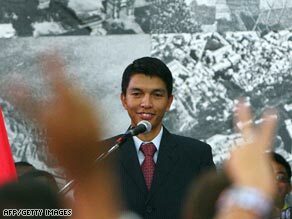 Rajoelina, at 34, is too young to serve as president, according to Madagascar’s constitution, which sets the minimum age at 40. And while his supporters pledged to hold elections in two years, the constitution says the head of parliament’s upper house calls elections within two months if something happens to the president.